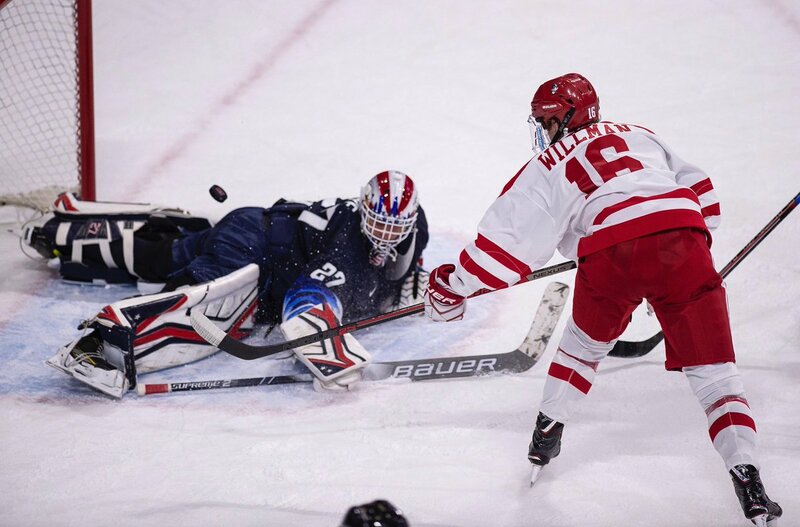 Sophomore Shane Bowers scored on a breakaway with 24.9 seconds left in overtime, lifting the Terriers to a 5-4 win over the NTDP U18s in an offense-dominated game at Agganis Arena. For the center from Halifax, Nova Scotia, it was his second goal of the game. Junior co-captain Dante Fabbro, graduate transfer Max Willman and freshman Joel Farabee had the other BU scores. Four future Terrier skated for the U18s—Trevor Zegras (3 assists), Alex Vlasic (goal), and Case McCarthy—all 2019 recruits—and 2020 recruit Cade Webber. Zegras' first assist, less than a minute into the game, led to a goal by Judd Caulfield who converted a loose puck in the crease. The U18s continued the attack early in the period, but Fabbro skated into the zone and ripped a shot top shelf from the left circle to knot the score at 10:57 with assists to freshman Jack DeBoer and sophomore Cam Crotty. The visitors regained the lead early in the second on a power play goal by Matthew Boldy following an entry pass from Zegras. BU tied the score at 14:27 when Bowers finished a two-on-one rush, assisted by sophomore Logan Cockerill and junior Patrick Harper. Terriers went on top three minutes later when junior Patrick Curry kept a puck in the offensive zone and found Willman alone at the goalmouth and he roofed a shot, making it 3-2. A minute into the third period, BU doubled its lead when Farabee completed a 3-on-2 rush, snapping home a shot from the high slot after passes from Ryan Cloonan and Kasper Kotkansalo. Midway through the period, Zegras’ one-timer from the top of the right circle was saved by Jake Oettinger, but Vlasic pounced on the rebound to cut into the BU lead. Less than a minute later, a shot from the point glanced off Owen Lindmark and trickled past Oettinger for a 4-4 tie. 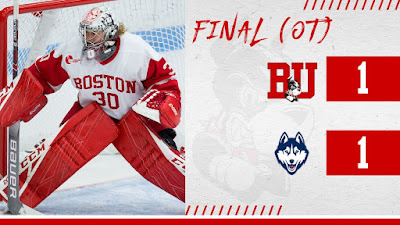 As time wound down in overtime, BU pressured the U18s along the wall in the center zone. Curry controlled the puck and slid it cross ice to an unmarked Bowers who skated in, deked Cameron Rowe and deposited the puck behind him for the win. Oettinger stopped 35 shots, including 16 of 17 in the opening period when Team USA was peppering him with shots. Rowe had 30 saves for the U18s. BU travels to Merrimack tonight for its first Hockey East game of the season. BU’s newest recruit, Selects Hockey Academy forward Ethan Phillips, is playing for USHL Sioux Falls this weekend and next. He had an assist and two shots and was +1 in the Stampede’s 6-5 win against Waterloo on Friday. Phillips was drafted at #39 overall by Sioux Falls in the 2017 Futures Draft. 2020 recruit Dylan Peterson assisted on the NTDP U17s first goal in a 7-3 loss to Central Illinois, but perhaps he deserved the goal. Brett Berard with some nifty moves near the blueline and he breaks in and appears to ring a shot off the post with Dylan Peterson cleaning up. Terriers and UConn played to a 1-1 tie at Walter Brown Arena Friday night. Junior Sammy Davis scored in the first period before UConn’s Morgan Wabick matched that goal with a second period power play score. 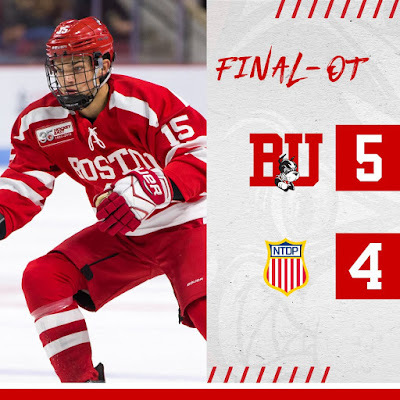 The third period was scoreless, and while BU dominated overtime, neither team could produce a game-winner. 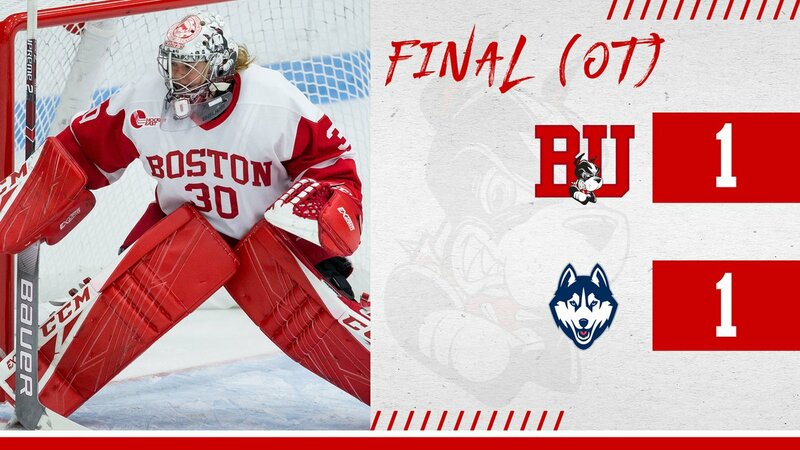 Corinne Schroeder made 31 saves for BU, which had stormed the Huskies net with 42 shots.